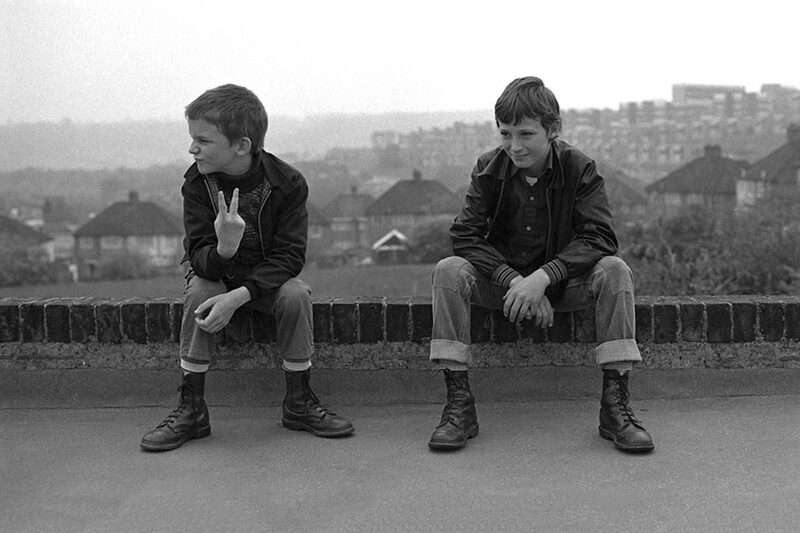 Flipping a V-sign at the camera, two young boys wear Dr. Martens, thick socks, turn-up jeans and Harrington-style jackets with plenty of attitude. Photo by Gavin Watson circa 1979. In 1967, a man walked into a utility clothing store in the north of England, purchased a dark blue boiler suit and felt himself drawn to a pair of orange rubber boots. Despite the colour, he was tempted. Had he spent a few minutes less contemplating the idea, he might not have come across a shoe that would change his – and thousands of others’ – futures: the Dr. Martens boot. The man was Pete Townshend, frontman of The Who and ergo one of the most influential characters of last century, the year was remembered as the Summer of Love, and the shoe was about to scissor-kick its way onto the world’s stage and beat up anyone who tried to make it leave. Townshend wore the boots that night and subsequently described his performance as “a revelation”. Despite having made its show-biz debut in the late ’60s, Dr. Martens had actually been around since the 1940s, when a doctor named Klaus Maertens developed the design. Maertens had worked as a cobbler in his youth and was enlisted in the German army in his twenties, during which he broke his foot skiing. The standard issue military boots he had been provided with were unyielding and uncomfortable, and he was driven to create something of a higher quality. Using recycled material looted from war-ravaged Munich and leftover air force materials, he and his friend-made-business partner Dr Herbert Funck developed a technique that allowed them to heat-seal the sole onto the uppers, creating air-tight compartments that cushioned the foot and offered unprecedented support. By the 1950s, Maerten’s ambition and Funck’s engineering experience had produced the perfect workers’ boot. The air-cushioned soles were an innovation, and arrived at just the right time; thousands of men had spent years in unforgiving army boots, and the earliest example of shock-absorbent footwear was to be a hit with everyone from postmen to housewives: in the first decade of their inception, 80% of sales were to women over the age of 40. In 1952, business was so good that they opened a factory in Munich, having spent many years producing the shoes in a small shack, a workshop and even an army barracks. The 1950s bred youth culture, teenagers and the feeling of post-war recovery; what better time to pitch a product to a demographic developing their own identity, with a little disposable income and a lot to say for themselves? But competition was tough, and the decade was slow for DM, in spite of Teddy Boys adopting a creeper-style shoe that was similar to that of the early DM designs. Even so, in 1959, British shoe manufacturer R. Griggs Group Ltd bought the patent rights, adjusted the design of the heel, introduced the signature yellow stitching and trademarked the soles as AirWair, anglicising the brand name in the process. Before long, the boot previously assigned to miners, the military and manual workers had branched into a wider social context and taken on Britain, bringing with it its kickass utilitarian design and functionality. Taking its name from the date of its UK release (1/4/1960) the cherry-red eight-eyelet 1460 model is the most strongly associated with Dr. Martens. It is thought that the initial black leather skins - introduced for the UK market - were to have an ‘oily’ finish so as to be appropriate in East London’s fish markets, but a stray batch made it through quality control without it, and the matte black leather’s rough-and-ready feel was met with unexpected approval. While the boot was still a success among those who required their footwear to be tough on the outside but padded on the inside, it wasn’t until Pete Townshend introduced the shoe to rock ‘n’ roll that they truly found their niche six years later. He, too, was enamoured with the air-cushioned soles and attributed his energetic performances to them. In Dr. Martens: A History of Rebellious Self Expression, Townshend noted that “their toughness combined with their softness and flexibility is what made them so perfect for the pseudo-athletic routines I performed on stage”. The direct impact Townshend’s endorsement had on the business was instantly visible: DMs quickly became a part of the music scene’s vernacular, appearing on musicians, gig-goers, punks, goths, hippies and skinheads. The variations of subcultures encouraged younger generations to challenge the establishment, but the latter became one of the more controversial groups. Fiercely proud of their appearance and working class background, the earlier waves of skinhead culture gave a voice to the underdogs of society, but their bark was often worse than their bite; their interest was in self-expression, not the racism that later nationalistic branches would later taint them with. Born in 1965, Gavin Watson was a key witness of the movement; he grew up on a council estate in Buckinghamshire, and bought his first pair of eight-hole DMs aged 12. The photographs he took growing up in the early ’70s became iconic representations of the skinhead subculture, and he recalls the violent undertones that sometimes crept into their sartorial choices. “The way we cut off the leather at the front to reveal the steel caps – those boots were seen as weaponry and you felt safe wearing them,” he told The Guardian. “You had to christen them by kicking someone with them. It didn't matter who, and if you got some blood on them that was even better." Ironically, photographs of the group clashing with police in 1982 show both sides wearing DM boots; their tough-guy attitude provided strength and solitude to all who wore them. An element of this would go on to democratise Dr. Martens, or as Townshend sang “It don’t matter where you’re from, what matters is your uniform. Wear your braces ’round your seat, Dr. Martens on your feet.” They were to become the every-man’s shoe, transcending class, background and wealth. The inevitable allure of danger and menace, however, only heightened the mischievous charm of the Dr. Martens boot, and with music making its way across the world, so too was the ideology of the shoe. They came with spades of working class credibility and a (somewhat misplaced) patriotic pride in the British-made shoe. Labour politician Tony Benn adopted the boot to express a solidarity with the working classes, and high-profile bands like The Who, The Clash, The Specials and The Stranglers inspired their fans to follow suit. Viv Albertine of the Slits, and arguably the first woman to wear the traditionally masculine boot with a dress, was another to kick back against the norm. Having lived with Sid Vicious, she told Dazed: “He got me into so many fights, he was the reason I started wearing Dr. Martens.” Elton John’s appearance in 1975 rock opera Tommy, in giant moc-Doc’s, and their supporting role in Quadrophenia also cemented their place in popular culture, a place they’ve done well to preserve. Today, Dr. Martens has long since outgrown its humble beginnings, and is well on its way to shrugging off the more negative associations that football hooligans and fascists laced it with. “Docs are the perfect footwear for getting things done,” the brand’s UK Production Manager Stephen Bent says. The concept of self-expression and rebellion are at the core of the brand’s identity; “it’s in our marketing, our designs, old and new, and it’s a characteristic you’ll find in the people who work here. It’s literally in the handbook.” Vintage menswear expert Josh Sims agrees, in that “The very appeal of DMs is that they are what they are. You wear them as you see fit. You make them your own. Because DM are regarded as a staple of sorts, they simply move in an out of fashion as fashion dictates.” The fact that Dr. Martens now provides a range guaranteed to last ‘For Life’ illustrates the confidence it has in their enduring cool; a lifetime guarantee for every pair ensures they will be handed down from generation to generation, and in fifty, a hundred years time the legacy will live on, through both the underground music scene and out on the streets – a permanent footprint stamped firmly on the history of British culture. 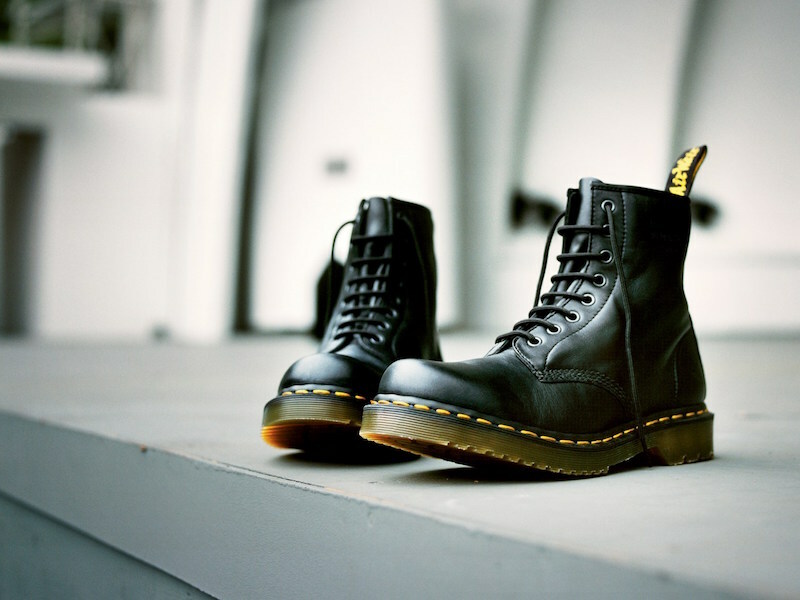 Dr. Martens’ 8-hole 1460 model in black, with signature yellow stitching and trademark ‘AirWair’ label. Read more in Dr. Martens A History of Rebellious Self-Expression by Martin Roach. 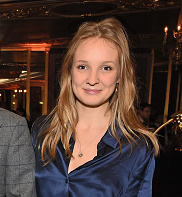 Anna is a freelance writer and former staffer at The Rake. She is passionate about travel, well made clothes and homemade chocolate chip cookies.